If you’re looking for a dinner entrée that is as meaty as it is healthy, look no further! 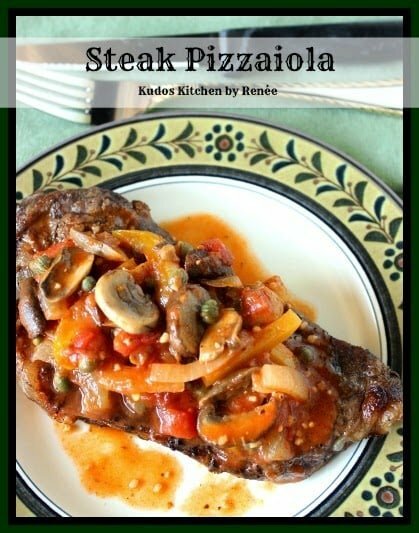 This recipe for Steak Pizzaiola combines delicious grilled strip steaks with a topping of sauteed mushrooms, onions, peppers, capers and a can of Red Gold tomatoes, that will bring it all together in the end. A few weeks ago I was sent some cans of Red Gold’s wonderful product of canned tomatoes in order to participate in the Red Gold Summer Grillin’ Party that runs from June 25th – July 23rd. I know I’m down to the wire with my recipe here but better late and never, especially with something this easy and delicious! This topping is so delicious you’ll be happy to have the leftovers to use as a side dish for other upcoming meals or to use as a sauce for anything from pork, chicken and even fish dishes. -Grill steaks on an outdoor grill to your preference of doneness. -Meanwhile in a large skillet over medium/high heat saute the onions and yellow peppers in the olive oil until slightly wilted (approximately 3 minutes). Season with salt and pepper. -Stir in the mushrooms and garlic. Cook, stirring occasionally (approximately 3-5 minutes). -Stir in the vermouth, canned tomatoes, rosemary and tomato paste. Cook until the sauce reduces by about half (approximately 10 minutes). -Stir in the capers and butter to finish, and remove the rosemary sprigs. 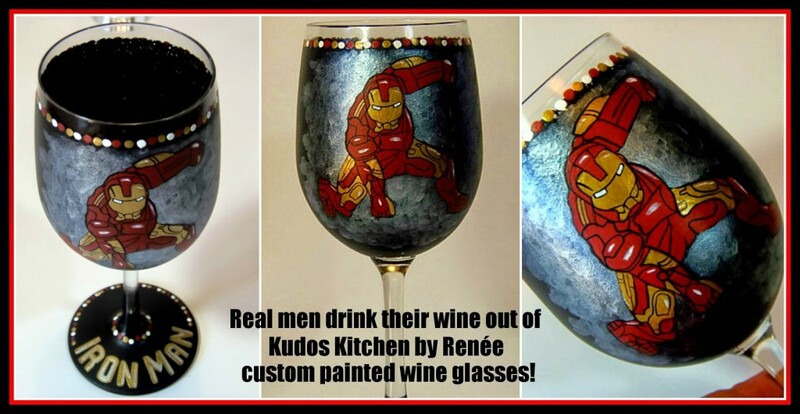 -Serve the sauce over the grilled steaks. Thank you to Red Gold tomatoes for providing me with their fine products to create this dish. This is in no way a sponsored post, and all opinions I’ve share are strictly my own. 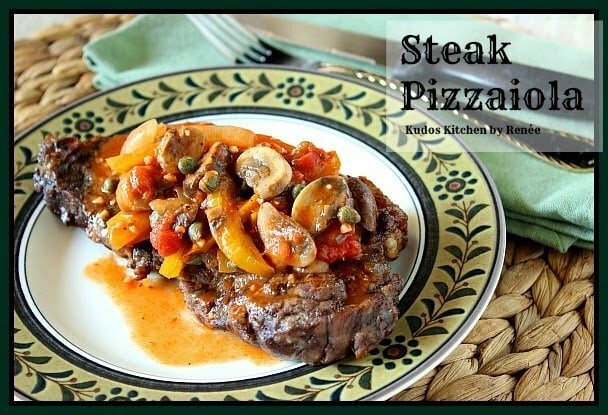 What I love most about this Steak Pizzaiola is that it appeals to manly men and women alike. It’s the best of both worlds and it’s now one of my new favorite steak dishes. I hope you enjoy it as much as we did!